"I don't know if I'm rocking this cape as hard as I could be." My buddies Miranda and Kristin laughed as I said this at lunch because honestly! How many people have ever said that sentence in the history of mankind? I'm not in the habit of buying capes, but I do think this one is quite adorable. I was so excited to get this last Thursday from Leproust Vintage as part of the Delightful Dozen clothing exchange. The manager at Ross was so happy to sell me this ring. He said, "I thought we'd never sell that ugly thing!" He obviously does not appreciate kitschy animal baubles. I love it! 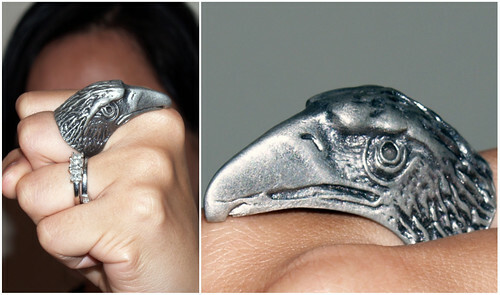 I think my eagle ring is hilarious! In other news, huge congrats to Jen over at JenLovesKev who announced that she's pregnant, too! She's due about six weeks before I am, but it will be fun to have to be the Pregnant Pair together out of the Delightful Dozen girls! Where have you been all my life, yellow coat?